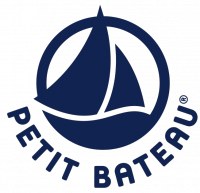 Petit Bateau is a French company and brand of children's clothing. In the 1990s it started producing for youngsters aged from 12 to 18. It all started from a white cotton "petite culotte" invented by Pierre Vaton de Troyes in 1893 when he took his scissors to the encumbering underwear worn by his 13 children. An empire was born which reigned until the 1970s, when it begins to suffer at the hands of the competition, but was saved from bankruptcy by the Breton cosmetics group Yves Rocher. 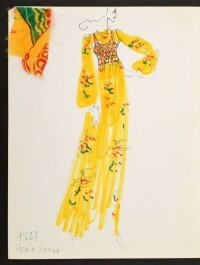 After a disastrous year they re-launched the brand in 1988 with an advertising and communications strategy devised to rid it of its dated image (with adverts by Sarah Moon). 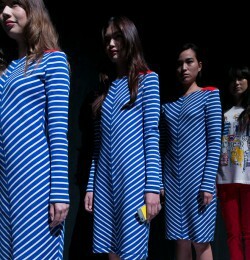 In 1994 Lagerfeld sent his models, led by Claudia Schiffer, down the runway in tight Petit Bateau T-"shirts. From that moment, mothers also started wearing the T-"shirts designed for 12, 16, and 18 year olds. The company's new and increased success can be seen in the following figures: 1,800 employees; 100 own-brand shops around the world; 25 million T-"shirts, briefs, and other cotton garments made in France (2 factories), Turkey, and Morocco.